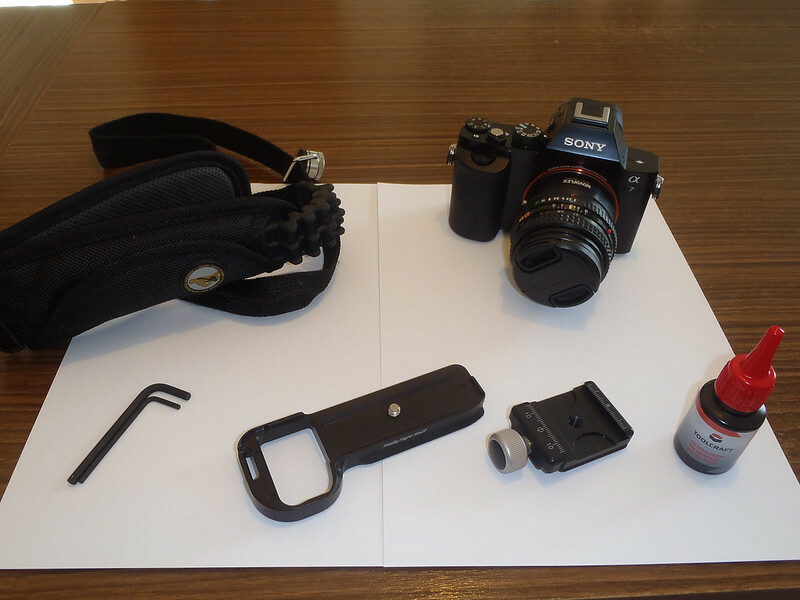 I ordered two clamps with the plate, one for my tripod and the other for my SunSniper camera strap. They came in a simple envelope. There is no fluff. My first impression after unpacking them was: “Wow, those are really quality pieces”. Here are all the parts before I mounted them. In the front, you can see the camera plate (center left) and one of the clamps. 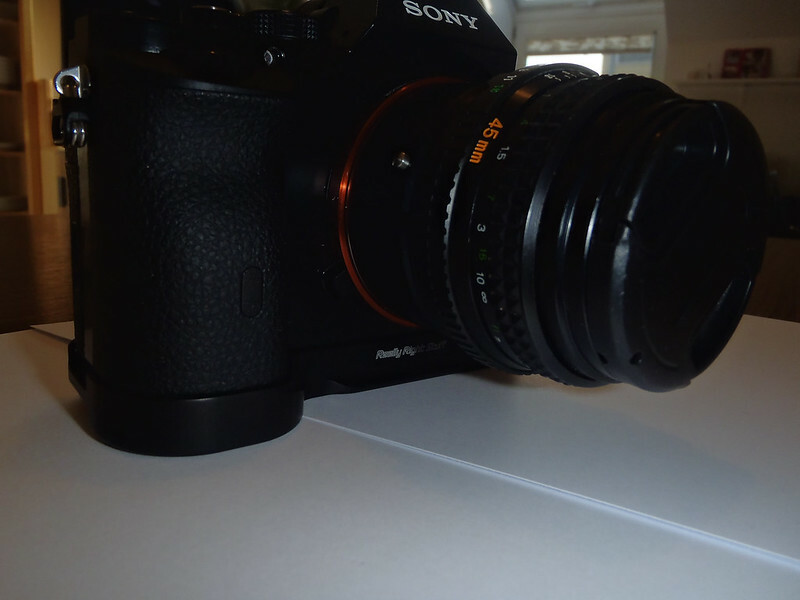 First I mounted the camera plate on the A7. The plate can stay on the camera, so I put a few drops of medium strength threadlocker on the tripod screw [Update: Really Right Stuff just told me that they do not recommend thread-locking on camera]. 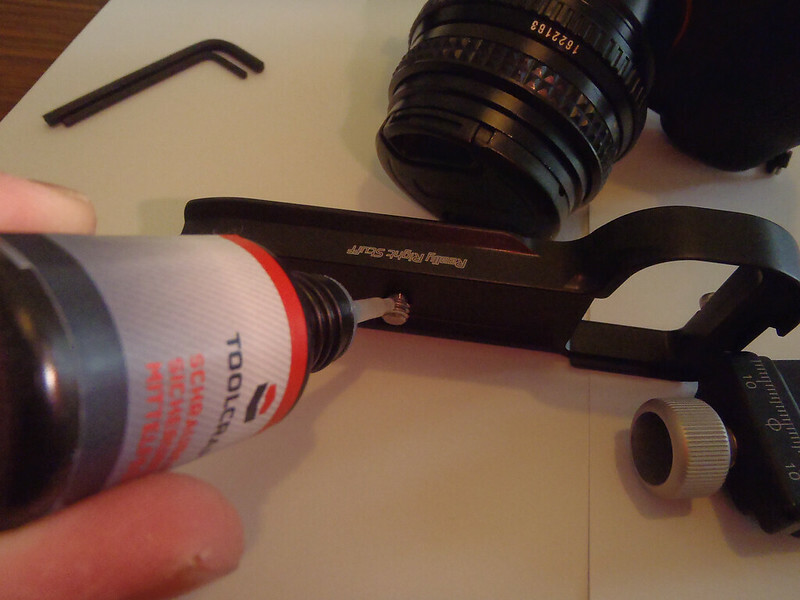 I have also used some threadlocker on the screw of the camera strap when I mounted the clamp. 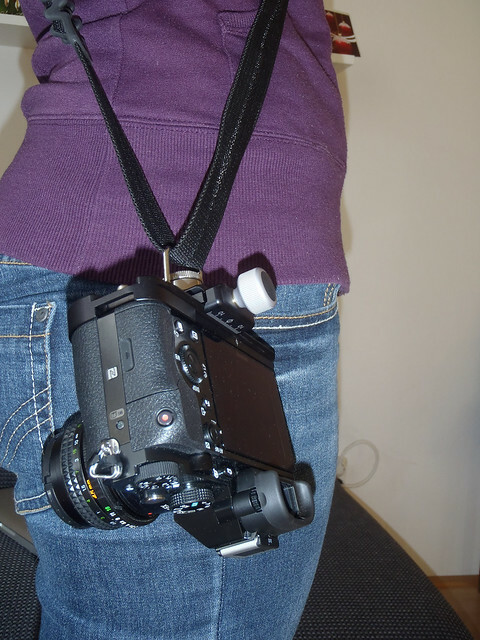 Here is a picture of the camera hanging on the SunSniper strap. 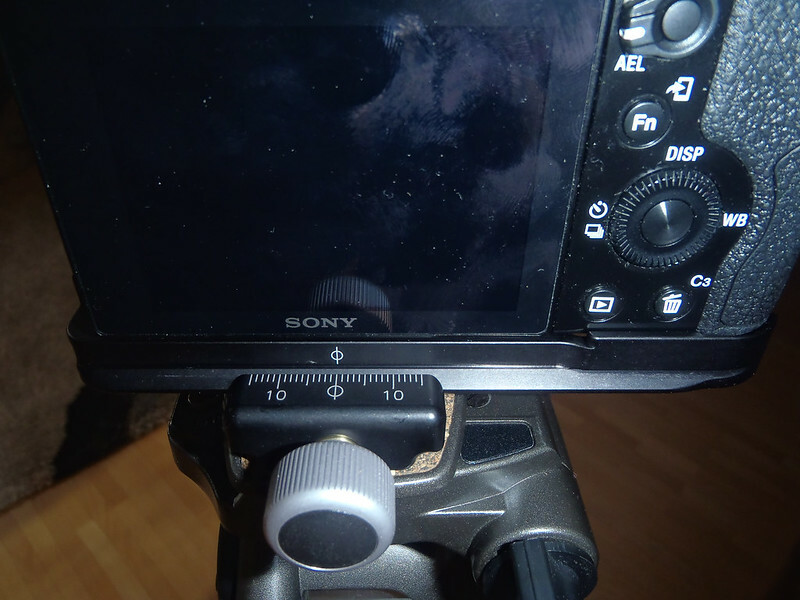 You just have to turn the knob of the clamp slightly, then you can slide the camera out of the clamp. But when you fasten the knob, it holds really tight. 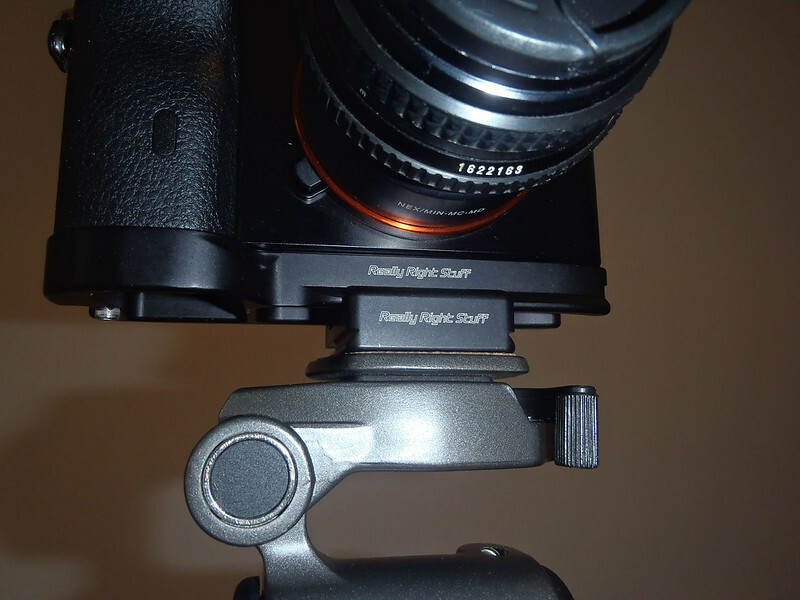 You can also turn the clamp around so the knob is not in the way when taking pictures. The Arca-Swiss system is absolutely awesome: Now I can wear the SunSniper camera strap at all time and quickly attach and remove the camera as I need it. This makes the SunSniper strap even more useful. I can also quickly mount the camera on my tripod. After using the Arca-Swiss quick release system for just a few days, I can’t imagine not having it anymore. The plate and the clamps are not really cheap, but they are totally worth every penny. Strongly recommended.